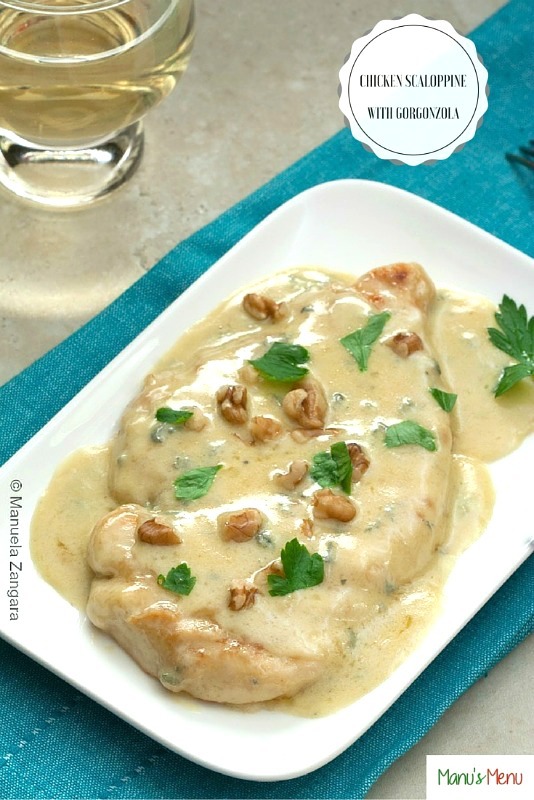 Today’s recipe is a classic of Italian cuisine and one of my all time favourite dishes: Chicken Scaloppine with Gorgonzola. I absolutely adore Gorgonzola, so I love anything made with it! 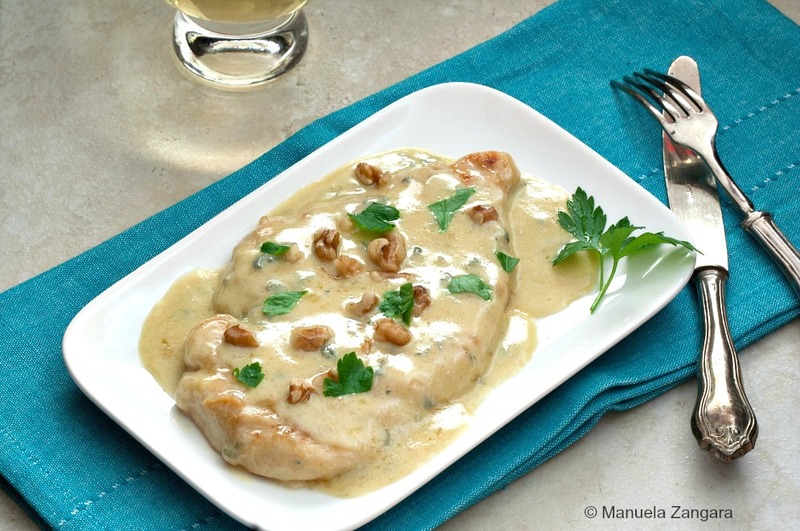 What are scaloppine (please not the spelling as I have seen it spelt in all sorts of ways on the Internet!)? 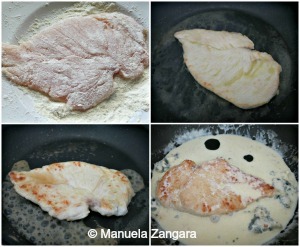 They are thin slices of meat… it can be veal, beef or chicken like in this recipe. 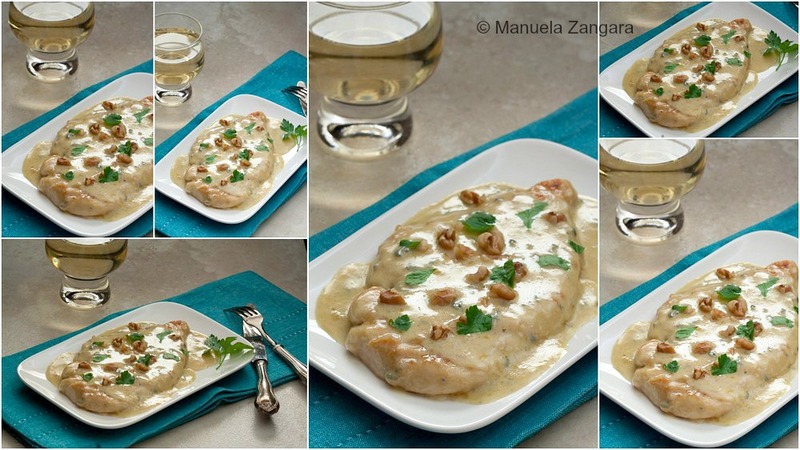 The sauces used to cook scaloppine are many and I have already shared another classic – Lemon Scaloppine. Today’s recipe is much more rich and somewhat sinful! If you like blue cheese, you will absolutely adore this Gorgonzola version! Make sure to serve it with my Ciabatta to soak up all that delicious silky sauce! Buon appetito! 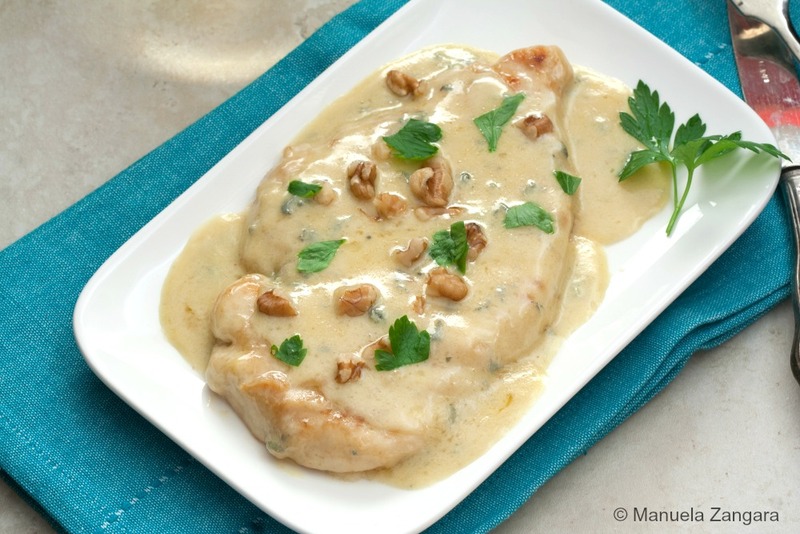 Chicken Scaloppine with Gorgonzola - thin slices of chicken breast cooked in a rich Gorgonzola sauce and topped with parsley and walnuts. Coat the chicken slices with flour. Warm the extra virgin olive oil in a pan and sauté the chicken in it. Brown well on both sides. Add Marsala and let the alcohol evaporate. Add the heavy cream and chopped Gorgonzola and mix to dissolve the cheese. Season with salt and pepper, cover and cook until the chicken is cooked through. When ready, top with the crushed walnuts and chopped parsley and serve warm. I haven’t been here in a long time, sorry I just forgot to drop by. Gorgonzola is definitely one of our favourite Italian cheeses, particularly with gnocchi, so good. Your Chicken Scallopini looks absolutely mouth watering. The walnuts add a very special touch. Our dinner for tomorrow night – after I (hopefully) manage to buy Gorgonzola in our Hypermarket (I am in South India!) – this is one of the dishes we always have when we are in Florence (nearly every year).